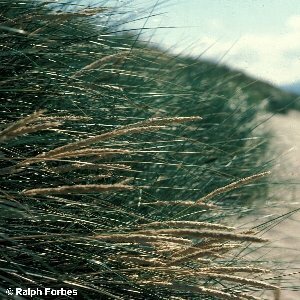 This is a coarse, long-leaved grass found only on sand dunes, where it is abundant and an important part of the structure and ecology of the dune systems. It binds loose, wind-blown sand with a network of branching rhizomes. The flower spike is large and conspicuous, bigger and coarser than most other native grass species. The long narrow leaf is rolled lengthwise into a tube, with the undersurface on the inside of the tube; this is a device to inhibit excess loss of moisture in what is a very exposed and harsh environment. This species is most obvious at the seaward end of dune systems, especially where the sand is loose and 'unfixed'. 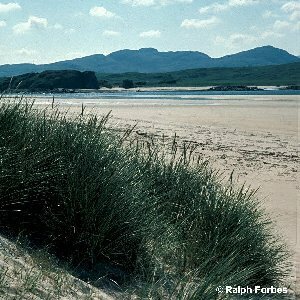 Older dunes, farther from the seashore, acquire a covering of other vegetation and the marram declines in vigour and abundance. Sometimes it was deliberately planted to help stabilise drifting and unstable dunes. The plant is also called 'bent', although this name is rarely used nowadays for this species. (Bent is also a name applied to Agrostis species). All names: Ammophila arenaria (L.) Link; Ammophila arundinacea Host; Psamma arenaria (L.) Roem. & Schult.